Louisville, KY (December 4, 2015) – For the past 62 years Mary Nelle White of Union County has dedicated her life to her family and farm while also serving her local Farm Bureau organization in a multitude of capacities. Because of that service, she has been named winner of the 2015 Distinguished Service to Farm Bureau Award and honored at Kentucky Farm Bureau’s (KFB) 96th annual meeting at the Galt House Hotel. White, at the age of 80, remains active in the family’s multi-generational farming operation taking care of the farm accounting. White Farms consists of 13,000 acres of livestock and grain production. 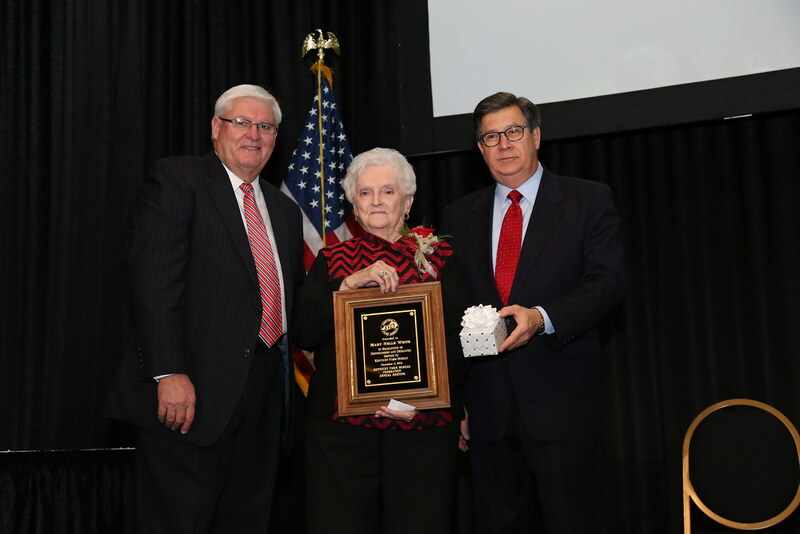 Mary Nelle White (center) received the 2015 Distinguished Service to Farm Bureau award at the organization’s annual meeting, held in Louisville. The award was presented by David S. Beck, KFB Executive Vice President (right), and Mark Haney, KFB President (left). White has served Union County Farm Bureau as president and vice-president numerous times over the years developing several outstanding programs. It was under her leadership the Union County Farm Bureau building was constructed and done so under the projected cost. During her tenure, Union County Farm Bureau had a state Young Farm Family winner, a state Discussion Meet winner, a state Excellence in Ag winner and a National Young Farmer and Rancher Chair. In addition, she has served for many years as a voting delegate at the KFB Annual Meeting and has been an American Farm Bureau Federation Women’s voting delegate. White has also served on many KFB committees including as the District 2 Women’s Chair on the State Resolutions Committee; she has worked with the Conservation District for 23 years; and under her leadership, the Union County Farm Bureau began a Safety Day program for fifth-grade students that has continued for 22 years. She has worked to promote member benefits and insurance services in her community while initiating projects to bring education about agriculture to county school libraries including a program called “Bushels for Books.” White has also provided the local radio station with public service announcements promoting Farm Bureau and agriculture. In service to her community, White served on the Sturgis Rest Home Board for many years, treasurer of the Sturgis Little League and still serves as her church’s treasurer. Local Extension Agent Rankin Powell said she has been a strong supporter of the Union County Extension Service, FFA and Farm Service Agency along with being a leader with 4-H.